I was driving home from Maine a few weeks ago, and saw a house up on blocks about to be moved. Have you ever seen a house moved? At the end of the 19th century, this was a common practice. If something wanted to expand into a space where there was an existing house; maybe they wanted to build a library, or a town hall, they would move what was there. The house was lifted up on supports using some kind of jack under the sills, then onto some kind of sled and moved by horses or oxen, to a new lot. The sled worked better in the winter. Or it was rolled on logs. At that time finding a place to put the house was not an issue – there was lots of land. It is harder to do this now. First of all near the city there is less vacant land to put it on. It often involves moving power lines, and blocking traffic. So the old house tends to get torn down and a new house built on the lot. We are loosing a lot of the older character of our towns. 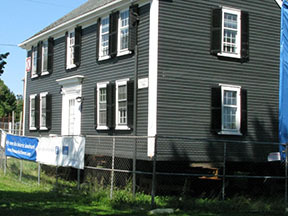 Sometimes a house has historic significance and can’t be torn down. There is a house sitting in Belmont looking for a place to be. It is a lovely house, built in 1760. This is the 2nd oldest house in Belmont. Go to www.thomasclarkhouse.com, and you can read the history of the house, and see an incredible video of moving it. Maybe you have an extra lot, and would like to restore a piece of history.